Tezcatlipoca, "Enemy of Both Sides"
Down to the real business of the poem. Nicole made a great post about fate and fortune, and Lucan misses no opportunity to tell us how Fortune is the supreme god at work here, having completely supplanted the less fickle Greek and Roman gods of old. Though plenty fickle themselves, they could be addressed. They could be appeased. They had reasonably clear motivations. Fortune is opaque, implacable, and plausibly malevolent. Lucan invokes Fortune constantly as the ultimate force behind everything. Tezcatlipoca, unlike other Mesoamerican deities, did not represent a particular complex of natural forces. Nor did he provide an emblem of tribal identity. He was the deity associated with the vagaries of this world, of ‘the Here and Now’, as ubiquitous and ungraspable as the Night Wind: fickleness personified. 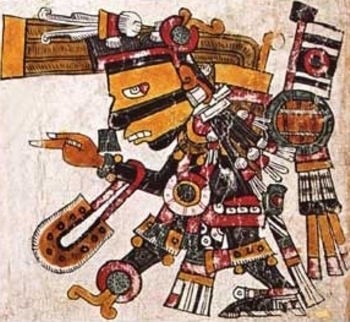 Tezcatlipoca in the Mexica imagining of him was the epitome of the great lorrd: superb; indifferent to homage, with its implication of legitimate dependence; all bounty in his hand; and altogether too often not in the giving vein. So it is with Fortune. At the start of the poem, Caesar is Fortune’s favored child, and he knows it. He has the upper hand against the aging general Pompey (aka Magnus), who is formidable but unfavored. Anyone reading the poem will know that Caesar will win the war but soon be assassinated, Fortune having abandoned him, so it is temporary. Yet even Caesar seems to realize this, and plunges headlong as long as Fortune is at his back. With Fortune on his side, Caesar is portrayed as possessing strength and will beyond that of the old gods. choked by sobs she spoke: “How far will you go? and faintness checked his footsteps at the river’s edge. Caesar, always and even now your soldier. Caesar hesitates briefly on seeing the ghost. He is not inhuman. But he responds with a skillfully rhetorical argument. (Rhetoric is very important at every level of Civil War.) He tells her that she should favor him, and that he is on her side. And he is on Rome’s side because Fortune is on his side. He will win, and so therefore he will be the protector of Rome. And thus he is already the protector of Rome; it’s just that a lot of people, including Pompey, don’t yet understand that. “Here, right here, I shed peace and our defiled laws. and now leans hard to burst free from the bolts. These Greeks trust in vain the haste of my course! there’s time to destroy Massilia. Be glad, my cohorts! Fate offers us spoils of wars along the way. of armed force if those I can conquer don’t fight back. I think this is more than mere simile. The Greek and Roman gods were notable in displacing gods of nature; relative to most cultures’ mythologies, there are far fewer nature gods, and by the time of the Iliad they have receded into the background, a point Moses Finley makes in his wonderful The World of Odysseus. Finley points out that sun god Helios is portrayed as mostly impotent and harvest/fertility goddess Demeter is just plain ignored. He attributes this to the Greek warrior culture enabling the elevation of the aristocratic Olympian gods. But in Lucan, those gods are absent, and when invoked are useless. Mars is mentioned, but more as a metaphor rather than as any actual deity. The superhuman forces at work are natural, not supernatural. Wind, fire, and all the other elements of the celestial clock trump any action. And those elements are all components of Fortune and Fate. Wind and fire obey the laws of physics and nature; so Caesar obeys his laws of nature, which drive him to endless violence. In the case of Massilia, the village declares itself neutral and though Caesar could simply go on, he takes the time to destroy them. Because it’s his nature. It would be better for an element of their religion to prove wrong and unfounded than for his auguries to come true, now that he knows how “unspeakable” the events to come are.